I know I shouldn’t be asking myself this question watching a film called Killer Klowns from Outer Space… but how seriously am I supposed to take this? The acting, fan following, and the premise clearly make it a B-movie. However, I’m not sure what kind. Is it self-aware and we can, therefore, assume that producers made any poor technical decisions intentionally for the sake of irony? Or is it trying to be straight-laced and therefore we can call out any problems with the film? The premise is quite simple. A group of aliens who look like clowns descend from space and wreak havoc in a nearby town. 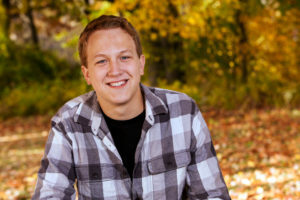 This leaves small-town boy, Mike, his girlfriend, Debbie, and her ex-boyfriend, Dave, to save the day. The pacing is what an astute observer might call “rocky”. The movie’s plot doesn’t seem to be there for its own sake, but only exists to take us from one sight gag to another. Mind you, these are really good sight gags, each one builds off iconography one might associate with clowns and impressive practical effects cause the viewer to realize them amazingly. However, I never felt like there was a beginning, middle, and end. I just felt like I was watching stuff kind of happen, dragging along with uninteresting characters I don’t care about. Speaking of, the characters in this film are one of the reasons I’m unsure of how to read the movie. The writers woefully underwrote them and the actors were horrible. On the other hand, the filmmakers seem to do an admirable job at everything else. From the cinematography to the spectacular animatronics, I even started to wonder if it was intentional. Maybe the directors told the actors to perform like that? Perhaps the characters were intentionally one-note in order to parody B-movies? I walk away not knowing, which is disappointing. However, it’s not as disappointing as the fact that the film barely made me laugh. However, that may be my fault more than the film’s. 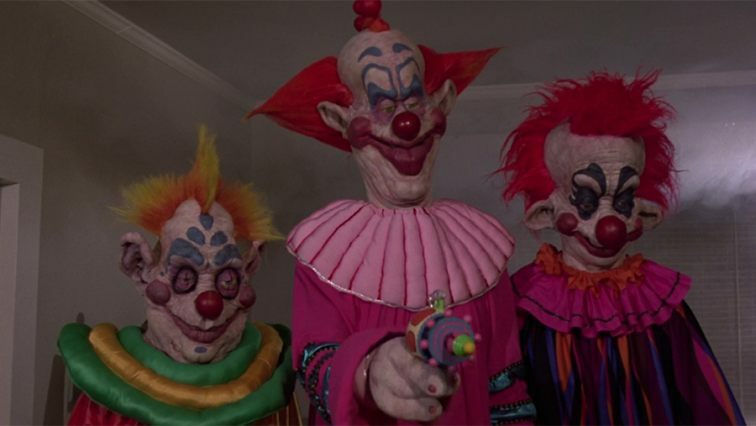 Killer Klowns from Outer Space recognizably emulates the Evil Dead II style of comedy, where you take something that’s supposed to be scary, like a murderous clown, and putting it in a darkly comic situation, like using a hand puppet to eat a group of civilians. While some people obviously find that funny, I myself never cared for that style of comedy. My main issue is you shouldn’t take away the scare factor just because you made the monster do something funny. For example, in one part of the film, one of the clowns puts on a pair of boxing gloves and punches a guy’s head clean off. I can see how the joke works in terms of subverting expectations, but that still doesn’t change the fact that a scary clown knocked a guy’s head into a garbage bin, killing him instantly. Killer Klowns from Outer Space is a weird film in more than just concept. It’s very difficult to decide what to feel about this movie. It’s not funny enough to be a comedy, not bad enough to be unintentionally funny, but light-hearted and well-made enough that I can’t bring myself to hate it. If you’re looking for something unorthodox I can’t think of anything much weirder than this. Well, except for next week’s film. You can pick up Killer Klowns from Outer Space either digitally or its fancy new Blu-ray edition from Arrow.